Post from November 22, 2016 (↻ June 12, 2017), filed under Philosophy. 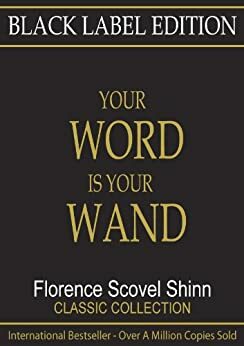 The third part of a new series, here are some highlights from Florence Scovel Shinn’s Your Word is Your Wand . So man has power to change an unhappy condition by waving over it the wand of his word. In the place of sorrow appears joy, in the place of sickness appears health, in the place of lack appears plenty. Fearless faith and the spoken word brought [a gift of 6,000 dollars] to pass. The affirmation of the magic purse is very powerful, as it brings a vivid picture to the mind. There is no truth in lack or limitation. Happiness and health must be earned by absolute control of the emotional nature. Power moves but is never moved. When man stands calm and serene, has good appetite, feels contented and happy when appearances are against him, he has reached mastery. […] universal supply is endless and immediate and all his needs manifest instantly on the external. Every man has power to lift the fog in his life. It may be a fog of lack of money, love, happiness, or health. My student […] replied that God was her supply and every day was a good day. For example: A woman came to me saying a man had owed her a thousand dollars for years which she could not compel him to pay. I said: “You must work on yourself, not the man,” and gave her this statement: “I deny debt, there is no debt in Divine Mind, no man owes me anything, all is squared. I send that man love and forgiveness.” In a few weeks she received a letter from him saying he intended sending the money and in about a month came the thousand dollars. […] This time she tried non-resistance. She blessed all the cousins in the Universe and sent them good-will, for she knew if she didn’t, every man she met would be stocked up with women relations. The Spiritual attitude towards money is to know that God is man’s supply, and that he draws it from the abundance of the spheres, through his faith and spoken word. When man realizes this he loses all greed for money, and is fearless in letting it go out. With his magic purse of the Spirit, his supply is endless and immediate, and he knows also that giving precedes receiving. “Nothing is to good to be true. Read the whole book: Your Word is Your Wand .